LA PUYA, Guatemala (CNS) — For more than a year, Modesta Hernandez and some of her neighbors clung tenaciously to a small stretch of dirt road in the mountains of Guatemala, preventing vehicles from entering the site of a proposed gold mine. In May, hundreds of riot police pushed them out of the way. Today, the mine is under construction and vehicles come and go, yet Hernandez still keeps vigil at its entrance. The presence of the church at her side keeps her from losing hope, said the 66-year old Catholic woman. “We won’t let hope die just because they knocked us down. We are on the side of Mother Nature and the God of life, and we’ll stay until they stop bothering us. And having the church on our side helps us know we’re not alone. The priests encourage us and give us strength to continue forward,” Hernandez told Catholic News Service. Hernandez lives in San Jose del Golfo, the closest town to the gold mine being opened by Kappes, Cassiday & Associates of Reno, Nevada. The town’s Catholic priest does not support the protest and has not made an appearance at the mine entrance. The priest in Carrizal, another nearby town, is a bit more supportive. While he has not appeared at the “resistance camp,” last May he let activists ring the church bell to call residents to resist police. So it has fallen on Catholic leaders from other areas to accompany the protesters, who are concerned about the health and environmental impacts of the mine. Father Mario Absalon Alvarado Tovar, a Missionary of Sacred Heart priest, comes from Guatemala City once a month to celebrate Mass. 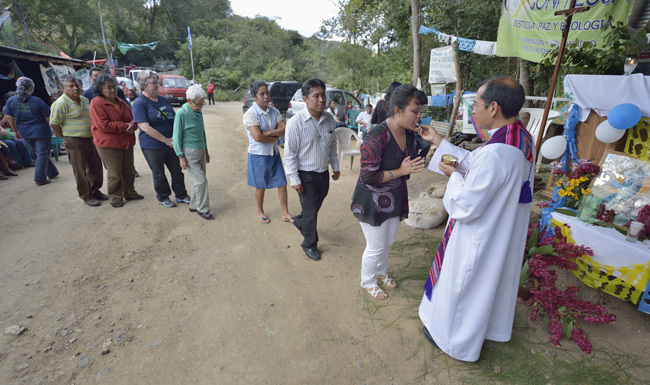 When Father Alvarado celebrated Mass at the mine entrance Dec. 7, he and some 50 faithful were surrounded by an equal number of police, who maintain a permanent presence to ensure the protesters do not block the road again. Father Alvarado, the provincial for his order in Central America, said he has been coming to the site for more than two years. Since police won’t let the protesters block the road, the altar is on one side of the road and most of the people on the other. During the Dec. 7 Mass, a police vehicle twice slowly drove through the middle of the Mass. Father Alvarado says he is unfazed by the police presence. “That’s where Jesus preached, in the streets, with the police of his time looking on. We’re just doing what Jesus would do,” he said. Bishop Alvaro Ramazzini Imeri of Huehuetenango, whose support for environmental activists has earned him death threats, has twice visited the protesters in La Puya. Jose Angel Llamas, a Catholic activist from San Jose del Golfo, said the protesters are not planning on abandoning their vigil at the mine entrance. He said they maintain several legal actions aimed to force the mine to stop operations. “Although the transnational corporations and the government are aligned against us, we’re here because there’s a deep faith among the people. It keeps us struggling for the right to have clean water and a dignified life,” he said. Catholic News Service contacted Kappes, Cassiday & Associates, and its president forwarded queries to the mine manager, who did not respond. Father Jose Antonio Pacheco, a Jesuit who works with youth under a bridge in a poor area of Guatemala City, also comes regularly to La Puya. He was there May 23, when more than 20 people were injured when police cleared protesters from the mine entrance. “People had been here resisting peacefully, but the state came with tear gas and riot police. The community was defending their right to water and life, but the state was defending the interests of the mining company,” Father Pacheco said.